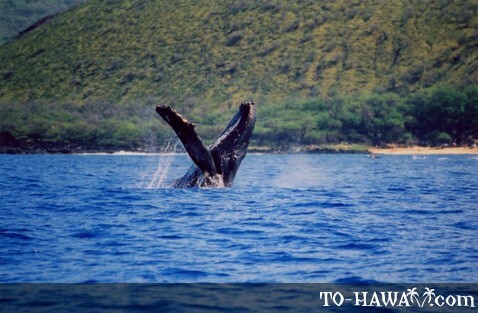 Whale watching is a seasonal and very popular activity during the winter time in Hawaii. 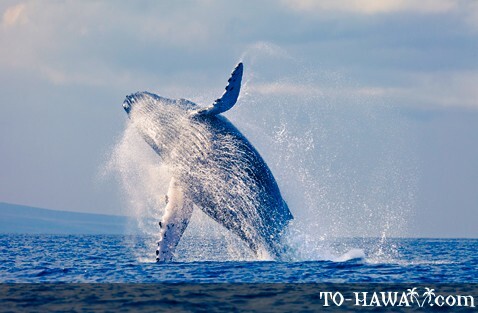 There are at about 10,000 to 15,000 humpback whales in the world, and over 1,000 of them visit the tropical waters of Hawaii every year at the end of November. They stay until the end of April; some are even seen until the middle of May before they make their long way back to Alaska. 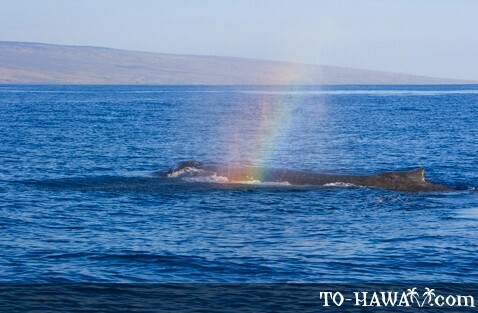 Whales can be seen in the waters of all the Hawaiian islands, but most of them like to hang out in the sheltered and shallow waters between the islands of Maui, Lanai and Kahoolawe. 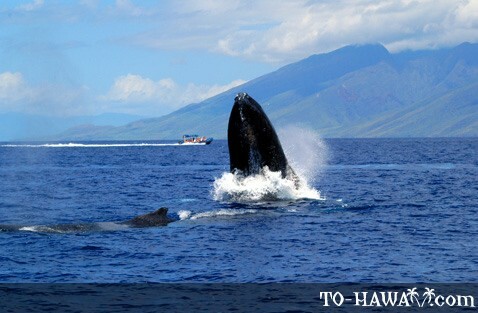 It is therefore best to do whale watching on Maui. 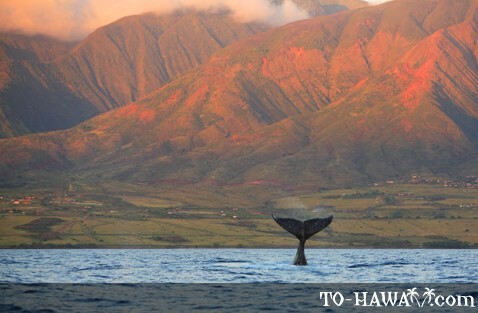 Maui whale watching tours usually depart from Lahaina Harbor or from Maalaea Harbor. 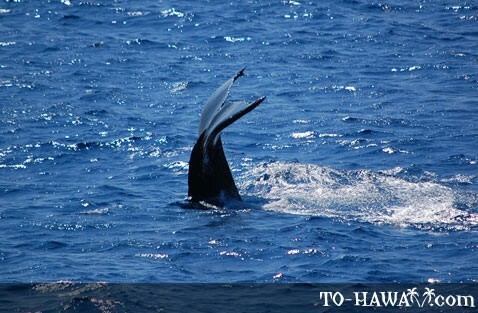 There are many tour operators that organize day and sunset whale watching cruises on small and larger vessels. Most of them guarantee whale sightings, and if by any chance you do not get the chance to see them, you may get offered another tour for free. Usually, the tour price also includes a drink, snack and detailed narration. Some tour providers even provide hydrophones aboard that allow you to hear the whales' communication among each other. 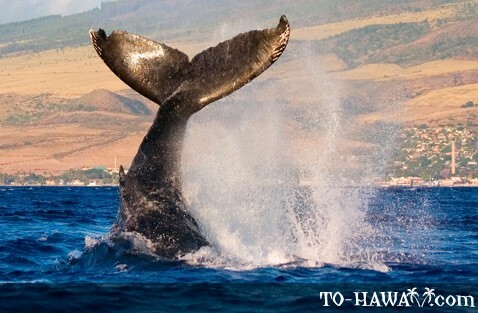 The Pacific humpback whales migrate to Hawaii from Alaska and the coast of central California. Their 3,500-mile swim from their summer locations to Hawaii lasts about one to two months, depending on their swimming speed. The swimming speed is normally 3-9 mph (4.8-14 kmh), but case of danger, it can go up to 15-16.5 mph (24-26.5 kmh). The whales travel in large and loose groups, with almost no rest along the way. Their associations do not last longer than a few days. However, one exception is the strong and lasting connection between mother and calves. 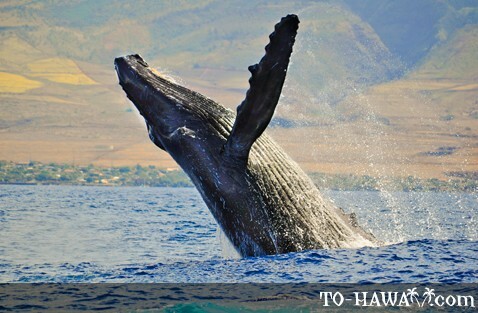 The warm, tropical Hawaiian waters provide good breeding conditions for the humpback whales. 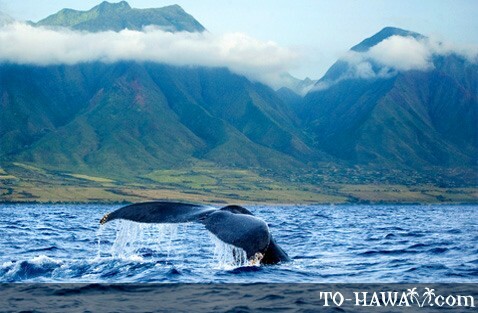 Many whales give birth while in Hawaii. The gestation period of pregnant females lasts between 10-12 months. 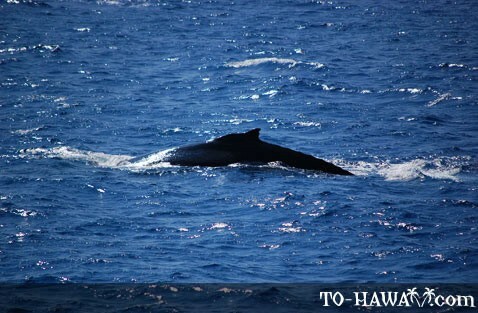 The Pacific humpback whale is a baleen whale and is the fifth largest type of whale, after the blue whale, fin whale, sei whale and the sperm whale. It is between 35 and 52 feet (10.6 and 15.8 m) in length and weighs about one ton per foot. The female is slightly larger than the male. The humpback whale has a huge heart. Its weight is about 430 pounds (195 kg)! Among scientists, the Pacific humpback whale is known under the name Megaptera novaeangliae. The whales received this name from the German naturalist Borowski in 1781. It means "Big-Winged New Englander." "Big-Winged" because of its huge tail and fins, and "New Englander" because of the fact that it was once seen on the coast of New England. The humpback whales are unique mammals because they have amazing talents and one of them is their singing ability. They know a huge variety of long, complex and beautiful songs. The humpback song is a mystery. No one knows why they sing and what their songs mean. The males sing long songs during the breeding period that are related with mating. However, it is not proven that the song is used as a tool to attract the female. Female whales can produce sounds as well, but only males can produce long and organized songs. The song length may vary and can last up to 20 minutes. It can be heard more than 20 miles away. It is phenomenal that all the males in the population sing their song in the same way, using the same behavior patterns and sounds. And when over time the song patterns change, all the males in the population make this change. Therefore, even when the song changes, they always sing the same song. 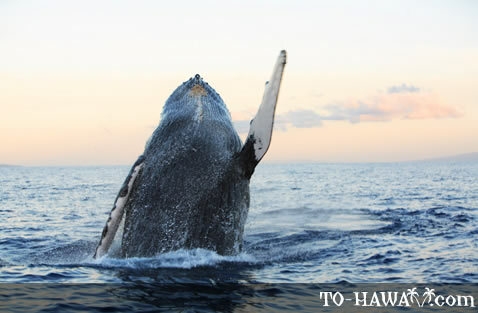 Another remarkable talent the humpback whales possess is their hunting ability, so called bubblenet feeding. Bubblenet feeding is a group hunting technique, where every participant has a specific role. One of the whales blows bubbles under a group of fish. Then the fish are trapped because they can not swim through the net of bubbles. After that, several other whales make sounds to scare and panic the fish. Then another group of whales swim in a circle and draw the fish up to the surface, where they are captured and eaten. The whales can consume up to one ton of food within a day. But overall, they don't feed while they are in Hawaii's waters.